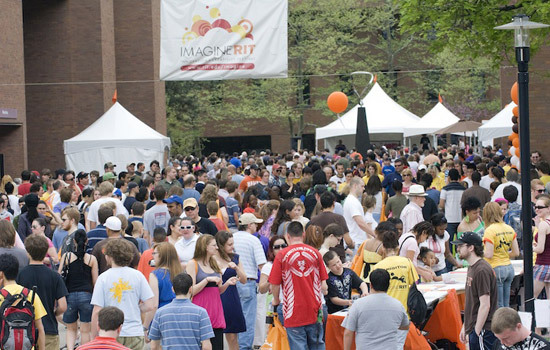 The annual Imagine RIT: Innovation and Creativity Festival drew 32,000 visitors to the RIT campus in May. 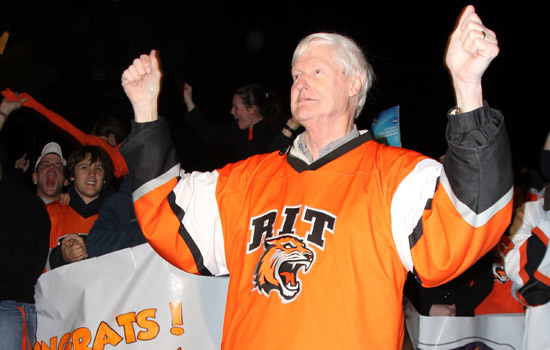 As RIT prepares to welcome in 2011 and say goodbye to 2010, it’s worth looking back at some of the significant milestones of the past year. The university marked success in many areas. Enrollment hit an all-time high. More than 17,200 students attend RIT—from its Henrietta campus to its global campuses around the world. RIT continues to expand its global relationships with its partners in Croatia, Kosovo, Dubai, the Dominican Republic, India, China and Turkey. RIT’s strategic alliance with Rochester General Health System continues to gain momentum. The university is establishing the Institute for Health Sciences and Technology, which is expected to be operational by fall 2011. It will channel areas of expertise through the College of Health Sciences and Technology—becoming RIT’s ninth college. Existing programs from several of RIT’s other colleges will form the core of the college. The institute will produce technological solutions to health care delivery and position the alliance as a contributing player in the reform of the nation’s health care system. The National Institute of Standards and Technology awarded a $13.1 million grant to RIT’s Golisano Institute for Sustainability to assist in construction of a new green facility that will house the Golisano Institute. The university launched a new master’s degree in sustainable systems to augment the Sustainability Ph.D. program. Also in the area of sustainability, RIT was named a “Sustainability Campus Leader” by the Foundation for Sustainable Endowments. RIT partnered with Flower City Habitat for Humanity to build a house for a family in Rochester. RIT student organizations worked with architects to redesign an existing house plan to incorporate sustainable features such as solar panels, a tankless hot water heater, a 95 percent energy-efficient furnace and soy-based foam insulation. Entrepreneur E. Philip Saunders, owner of Saunders Management Co. and founder of TravelCenters of America Inc., announced his commitment of $5 million to RIT’s business college that bears his name. Saunders’ gift to the E. Philip Saunders College of Business will help expand the school’s facilities and create three endowed professorships. Saunders called on all alumni and friends to come together to raise a total of $20 million to support the college’s vision. And the Kate Gleason College of Engineering continues to enhance its status as one of the top engineering colleges in the nation. The Gleason Family Foundation has committed $3 million to the engineering school to create the Gleason Family Foundation Faculty Development Fund. The men’s and women’s hockey teams elevated their programs beyond anyone’s wildest imaginations in 2010. In the spring, the men’s team captured the nation’s attention with its storybook run to the Frozen Four National Championship. The Tigers made their first trip to the Frozen Four in only their fifth season of Division I play and became the first team from the Atlantic Hockey Association to advance that far. In the semifinal round at Detroit’s Ford Field, the Tigers lost to Wisconsin. Heading into 2011, the RIT women’s hockey team is the top-ranked team in the country in Division III. It’s the first time in the program’s 36-year history that the Tigers have risen to the top spot. The team set another program record with 13 straight victories. In an effort to build on the hockey teams’ success, the university is making a power play to build a new ice arena on campus. RIT alumni Stephen Schultz ’89 (computer science), co-founder and chief technical officer at Pictometry, and his wife, Vicki Schultz ’94, ’99 (business administration, MBA), presented an opening gift of $1 million to the “Tiger Power Play—The Campaign for RIT Hockey” in November. The campaign’s goal is $15 million and targets alumni and other supporters of men’s and women’s hockey. It’s expected that a new arena—designed to accommodate 4,000 to 6,000 fans—will cost about $30 million. The university will cover the remaining cost. The exact location of the new arena has yet to be determined. A men’s hockey game at the Blue Cross Arena, along with Academy Award-winner Al Pacino and comedian Craig Ferguson, drew record crowds for Brick City Homecoming & Family Weekend in October. More than 17,000 attended homecoming events. Imagine RIT: What Will We Think of Next? The university marked another successful Imagine RIT: Innovation and Creativity Festival in May. More than 32,000 visitors descended on the RIT campus for the third annual festival. Guests experienced 400 exhibits, demonstrations and performances. RIT is gearing up for its next festival on May 7, 2011. The physical infrastructure of the RIT campus in the past year changed dramatically. Global Village, a $57 million residential and commercial complex, graces the west side of campus. In addition to student housing, Global Village features a hair salon, restaurant, international market, post office and gallery shop. The Constellation Commons for Global Learning is also a new facility housed in Global Village. It’s funded by a $1 million commitment from Constellation Brands Inc. The commons serves students and faculty as a touch point and clearinghouse for all aspects of global education at RIT, including study-abroad support, faculty exchange opportunities and multicultural programs such as the Future Stewards Initiative for Native American students. Construction crews also built a new bicycle path and pedestrian walkway, which includes a new transportation hub, Gleason Transit Plaza, behind the Wallace Center. World-renowned designers Massimo and Lella Vignelli helped take the wraps off the Vignelli Center for Design Studies, a three-story facility adjacent to James E. Booth Hall that houses the couple’s entire archive, exhibition spaces and a study area. RIT also has a new Campus Center located in the heart of campus. The 30,000 square-foot area is across from Clark Gymnasium. The unique space allows students to socialize and study. What does 2011 hold for RIT? Stay tuned! Anything is possible based on the amazing talent and commitment from members of the RIT family. With so much to brag about, RIT’s mascot Ritchie traveled the globe to ask RIT students to reflect on their accomplishments in 2010 and their wishes for the new year. We hope you enjoy their video messages in RIT’s holiday video. From the entire RIT family, we wish you a wonderful holiday season and a happy 2011!